Lives shaped by large, historical events can end up trapped in them forever. This was certainly true in the past, but I wonder whether it still applies in the present, when the events which flicker past us somehow seem smaller. 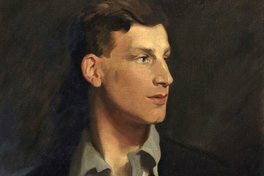 Peter Parker’s brilliant review (From Blunden to Sassoon, with Gratitude) illuminates this at work in the lives of Edmund Blunden and Siegfried Sassoon as expressed in their letters. Blunden and Sassoon’s experience in the trenches defined them as War Poets for the rest of their long lives. This was partly deliberate on their part: both poets were keen to “give the modern world the slip” (as Sassoon put it in 1938); both rejected and were sidelined by modernism (unlike, say, Graves); both celebrated the Kentish countryside where they’d grown up: “The hay was being made, and every cottage was a poem by Blunden”. Both men lived to observe with the wry scepticism of old soldiers the fiftieth anniversary of the outbreak of what Sassoon was by then calling “our horrid old War”. They were once more in demand, but as literary relics rather than poets still at work. History had claimed them half a century before and it never let them go. Will history claim any of our writers like that? Which of us will end up relics? Similarly, I think John Steinbeck’s books set during the depression – “In Dubious Battle” (1936), “Of Mice & Men” (1937) and “The Grapes of Wrath” (1939) – define him for many readers, so that some of his other great novels and short stories are often ignored. Steinbeck was still writing in the 1970s, and had written stories set in the recent past throughout his life, as well as some – like “Cup of Gold” (1929) – set in the more distant past. He is also strongly associated with California, although he did write stories set elsewhere, such as the Norway-based WW2 novel “The Moon is Down” (1942). Yes, the Depression definitely, in Steinbeck’s case (and I agree it’s unfair). It can work the other way about, too. I’m thinking of Scott Fitzgerald and how his novels, especially The Great Gatsby, help define the Roaring Twenties for us today. I suppose in Fitzgerald’s case it cuts both ways – he’s as irrevocably associated with the high jinks and cocktails and flappers of the Lost Generation as they are with him. And the other thing with him is how he sort of dodged Big Events, eg WWI and WWII – and yet he does this encapsulating-an-age thing in such a quintessential way.. Anybody writing a book set at the time of major historical events will obviously have a big decision to make on how greatly those events intrude upon or overshadow the narrative. In “War & Peace”, Tolstoy had characters whose awareness of Austerlitz and Borodino was limited to the impact of injury & death to their immediate relatives & friends, while the majority of the characters had previously been aware of the rise of Napoleon only as a fairly peripheral issue (apart from Pierre Bezuhov, who seems to have matched Beethoven’s progression from enthusiastic supporter to bitter opponent). Virginia Woolf approached this in an interesting way in “Mrs Dalloway”, where Clarissa is blissfully – and, presumably, wilfully – ignorant of the events of WW1 while surounded by evidence of its brutality. The suicide of the shell-shocked Septimus Smith serves only to spoil the mood of her party. Of course, everyone’s life goes on while major events accur around them. There’s no reason not to set an everyday story in a time and place where so much that is not everyday is happening. Jane Austen used to be criticised for that Clarissa-like obliviousness, in her case to the Napoleonic wars (in which her brothers served). Woolf wrote about “that immunity from war”, describing how private people in the nineteenth century had a less direct experience of war than those accustomed to the wireless or, indeed, being bombed. And in the detachment of their characters from historical big pictures, some writers counterpoint the mundane and domestic with echoes of epoch-shifting events occurring offstage, echoes sometimes more resonant to later readers than their contemporaries. Joseph Roth, whose “Radetzkymarsch” I’ve recently been reading, infuses his writing with an atmosphere of the dying Hapsburg empire. The Emperor, himself a character in the book, muses on its fading. Roth, like Fitzgerald not merely in their shared love of booze, is ineluctably associated with the period he describes, although writing about it after its demise. But the phrase “History claimed them…” seems somewhat overwrought for Roth and Fitzgerald. I’m not sure it did. Radetzky March sounds interesting. How much does it have in common with Musil’s “The Man Without Qualities” (which I only got about 1/5 of the way through)? The books are similar in theme, place and time and utterly different in style. Musil has more of a mystical bent, he packs his book with symbolism, much given to essayistic excursions, the whole modernist shebang, high concept, sometimes deliberately obfuscatory. Roth has a more traditional narrative, albeit with cunning, unsettling variations, often zooming into intimate closeups. I’m more of a Roth man, me. The Radetzkymarsch is one of my fave books.